In many homes, I see people making the mistake of treating the smaller bathrooms as an afterthought. Just because a space is small, it doesn’t mean you can’t make a big impact. Your half-bath may not be where you spend the most time, but it’s the one guests are most likely to see. With some intentional design choices, you can transform even a compact washroom into a thing of beauty. 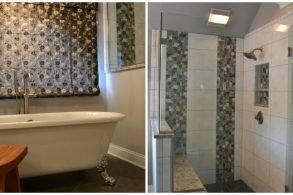 We recently worked on a hall bathroom for a client, and I’m really pleased with the results. By choosing unique and stylish fixtures and surfaces, we were able to make a statement in this smaller room. In the shower, we chose a fixture that was great looking, and also functional for the client. Having a showerhead you can take down and use as a sprayer makes the shower area more versatile. We added a built-in spot for soap and shampoo to make the best use of the space. You can also catch a glimpse of the basin sink! We also used contrasting textures to add visual appeal to the space. This rough and rustic tile was placed alongside a smoother natural finish. Playing with textures is an easy way to make a small space stand out. A glass shower door allows the gorgeous tile work to be visible, and helps make the room feel bigger. Do you have a small bathroom that has you stumped? Contact us to get started now. We’ll explain our process, let you know the latest in design trends and innovation, and our team will be available to answer any questions you may have. Our next seminar is November 20th, and I’d love to see you there. If you can’t make the seminar, you can always come by our store or email us with your questions.